All about the White Star Temple, its history and transformational opportunities for you. Soltec is an Australian channel for the Ascended Masters, Angelic Realm and The Apostle. He has been a channel for over 25 years and now makes his resources freely available to you as part of his ongoing service. 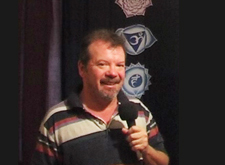 Soltec is a creative, spiritual man who has been blessed with a gentle and resonant voice which breathes much spirituality and love into the channelled recordings he makes. Recently, Soltec's channeling changed direction to become a University in which the Ascended Masters give beautiful, expansive, heartfelt lectures from within an energy pattern called the White Star Temple. He wishes to share these with you and welcomes your participation and feedback. TO SOLTEC . . .
"You are such a perfect medium to do the channelling for the Masters. You are beautifully attuned. What a gift to all of us listeners." "You are extremely gifted to be able to channel so many 'high powered' entities with such seeming ease!"